What is so special about a printed glass splashback with a high definition image? As you are probably aware, our toughened glass splashbacks are already available in virtually any colour you could imagine. We can match them to your chosen RAL colour or Dulux paint tone. We also supply and fit a wide range of textured glass splashbacks to add an extra tactile element of depth to your kitchen or bathroom. Recently we have responded to an increasing number of enquiries from clients requesting information on glass splashbacks with an image. The good news is that we are now manufacturing, supplying and fitting some amazing looking splashbacks. Some clients have asked for an abstract swirling picture and others have opted for pictures of cityscapes, countryside themes or animals. Here at Splashbacks of Distinction we like to provide our clients with the ability to add their own personality and individual style to their kitchen or bathroom. Splashbacks of Distinction combine original high definition artwork that is then printed on toughened glass. This delivers a pretty impressive feature that will make your kitchen or bathroom unique. Our printed glass splashbacks are very hygienic and so easy to keep clean. The printed artwork on the glass splashback will never crack or fade. 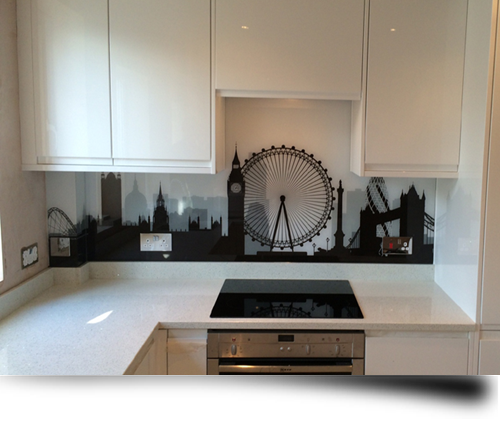 Our printed glass splashbacks are heat and moisture resistant. The printed glass splashback will be bespoke, setting your home apart from any other. In short, you can personalise your splashback. In the absence of a window and with some thoughtful lighting, the printed glass splashback can easily form a very pleasing vista. Like all our toughened glass splashbacks, there will be no grouting to yellow or trap dirt like a tiled splashback would. Our printed glass splashbacks don't just look fantastic in kitchens and bathrooms either, they will look amazing anywhere in the home. Splashbacks of Distiction have supplied and fitted their standard glass splashbacks to many domestic and commercial premises over the years, so why not think about a splashback with a high definition image on for your home or office? Splashbacks of Distiction create printed splashbacks to reflect the personal style of our clients, and compliment their decor. We always make certain that the glass is printed and fitted perfectly for a truly stunning result. The end result of the printed splashback could provide you with a nice subtle integration with your kitchen or bathroom design, or a feature with a genuine wow factor. The creative options are limitless. Seascape Inspired Printed Glass Splashback: Imagine Dolphins or Turtles swimming in a deep blue sea or a beautiful coral reef. Cityscape Inspired Printed Glass Splashback: Picture Manhattan Island by night or the vibrancy of Londons West End in a splashback. Nature Inspired Printed Glass Splashback: Contemplate a tumbling stream through the Yorkshire Dales, or the raw power of a flowing volcano. Flag Inspired Printed Glass Splashback: Demonstrate your patriotism with the flag of your choice. Stripe Inspired Printed Glass Splashback: Horizontal or vertical, wide or thin, stripes can make a room look taller or longer. Abstract Printed Glass Splashback: Not sure what design to choose, just go for something abstract. Retro Printed Glass Splashback: Imitate the trends, modes, fashions, or attitudes of the recent past. Animal Inspired Printed Glass Splashback: Appreciate the majesty of a Grizzly bear or the diminutive size and cuteness of your pet Chihuahua. Architecture Inspired Printed Glass Splashback: Cook your favourite curry next the the Taj Mahal, or enjoy your continental breakfast by the Arc de Triomphe. Food and Cooking Inspired Printed Glass Splashback: Gain some culinary inspiration from some mouth watering, colourful dishes. Floral Inspired Printed Glass Splashback: Enjoy the beauty of a summers day in the garden, even in the depth of winter. Remember, the above list is not exhaustive. If you have an image stored digitally of the correct definition and size, we will have something to work with.